The campaign for Indian Air Force’s acquisition programme of 126 medium multi-role combat aircraft (MMRCA) is hotting up for a European showdown. It is between European consortium’s Eurofighter Typhoon and France’s Dassault Rafale. At the Paris Air Show, we believe, the two finalists will be campaigning in their own ways. Here the CEO of Cassidian Air Systems, Bernhard Gerwert outlines the plans for Eurofighter. SP’s M.A.I. (SP’s): How do you view the development and the short-listing of Eurofighter and Rafale? 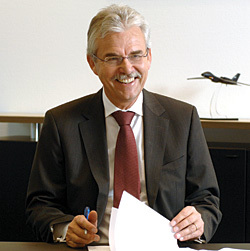 Bernhard Gerwert (Gerwert): We are very pleased to continue the Eurofighter Typhoon campaign in India. During rigorous field evaluation trials, our combat aircraft has demonstrated its outstanding capabilities to the Indian Air Force. We are confident that at the end of the selection process, the Government of India will be convinced that the most capable and advanced multi-role combat aircraft on the market is the best choice for safeguarding the nation’s security in the next decades. SP’s: Europeans once again seem to be leading one of the mega deals in India. How optimistic can you be for this market? Gerwert: The Eurofighter partner companies are optimistic at the prospect of winning India as a strategic partner because we can offer India the most modern combat aircraft available on the world market. Eurofighter has a life span of more than 40 years ahead. This means there is a tremendous in-built growth potential, in which we would like India to participate as a new partner of the entire programme. Our industrial partnership offer exemplifies our unique value proposition to India: Unprecedented transfer of cutting-edge technology and at the same time we are keen on winning the country as a manufacturing and development partner for the global Eurofighter programme. Plugging India into the global value chain of the Eurofighter programme will boost the development of an indigenous aerospace and defence industry in India. Getting the best combat aircraft technologies and becoming a partner in its further development, is an opportunity for India which no competitor can match. With Eurofighter Typhoon, India will gain access to a wide array of sensitive technologies from four leading defence and aerospace companies in Europe. SP’s: As the major partner in the Eurofighter programme and campaign leader in India, how do you view the MMRCA offset conditions? Gerwert: We are confident of meeting the offset requirements of the Indian Government set at 50 per cent. We are engaged in intense discussions with the Indian industry and other stakeholders to firm up various collaborative models which will enable us to meet our offset obligations to the utmost satisfaction of our customer. Even when we submitted the Eurofighter offset offer in August 2008, we already had signed more than 20 MoUs with major Indian defence and aerospace companies, both public and private. However, our aim is not just to comply with the RFP obligations. 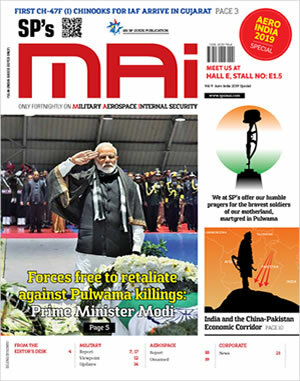 We have gone a step further and propose India the unique opportunity for an unmatched industrial partnership which would make it a full participant in the Eurofighter Typhoon programme. SP’s: Do you think the Indian industry can handle 50 per cent of the offset arrangement? Gerwert: Yes. We started to work on preparing India’s industry to meet the challenge of acquiring new state-of-the-art capabilities. In fact, we have initiated an industrial engagement plan in India to ensure a successful transition to the MMRCA. We will move very quickly in case India selects our combat aircraft. To ensure success in terms of time, material, quality and budget, we are ready to engage with HAL and support small- and medium-sized companies in India to absorb the envisioned technology transfer and offsets. The Eurofighter partner companies will offer India’s public and private industry, and research and development organisations a customised technological road-map ensuring the transfer of technology and expertise. This relates not just to the traditional area of production but also to design, development and engineering. SP’s: In the event Eurofighter becomes the final choice, what special commitment would you make to India? Gerwert: With the full support of the Governments of Germany, the UK, Spain and Italy we propose to make India an integral participant in the Eurofighter Typhoon programme. That is an unmatched commitment. It also opens up an entirely new potential for cutting-edge defence exports from India. Together with Europe’s top defence companies – EADS, BAE Systems and Finmeccanica – India could thus co-develop and co-produce future capabilities for the Eurofighter. These capabilities can then also be exported to other countries. Such a collaborative effort would greatly accelerate the development of India’s aerospace and defence industry and an independent study forecasted that the selection of Eurofighter Typhoon would create more than 20,000 high-skilled jobs in India.